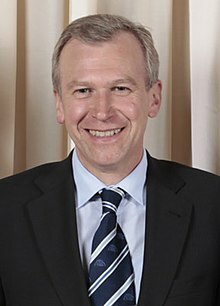 Yves Camille Désiré Leterme (Dutch: [ˈiːf ləˈtɛrmə]; born 6 October 1960 in Wervik) is a Belgian politeecian, a leader o the Christian Democratic an Flemish pairty (CD&V). He wis the 48t Prime Meenister o Belgium, frae November 2009 tae December 2011. This page wis last eeditit on 18 Mairch 2018, at 17:16.